The U.S. Department of Commerce released data last Friday showing that housing starts in April were up 26.4% from April of last year and 13.2% since March. In a vacuum, you would expect that the market would look favorably on the homebuilder’s market when the amount of homes being built is increasing. The home building market however continues to underperform as a sector in 2014. YTD the S&P Homebuilders Select Industry Index (TR) (which benchmarks homebuilding, buildings products, home furnishings, home improvement, retail home furnishings, and household appliances) is down -7.86%. Estranged from overall market benchmarks like the S&P 500(TR), which is up 2.14% on the year. 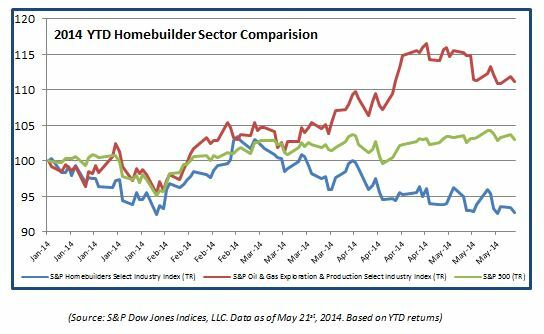 Homebuilder returns are even more dismal when compared to leading sectors such as energy exploration and production, as indicated by the S&P Oil & Gas Exploration & Production Select Industry Index (TR) which is up 8.41% YTD. A more telling story is the market’s perception of elevated risk regarding the homebuilder’s market moving forward. Market wide credit default swap spreads for the largest investment grade and high yield issuers have continued to tighten in 2014. This is illustrated by the S&P/ISDA U.S 150 Credit Spread Index which has seen highs of over 91bps in January drop down to 51 bps in 2014. Lower spreads indicate market participants are willing to accept lower risk premiums to “insure” the underlying entities. Credit default spreads in the housing sector have been widening however, up 21 bps in 2014 to 168 bps. Translated, default insurance on a credit with a notional amount of $100,000 would cost $1,689 or 14% more than it did in January. 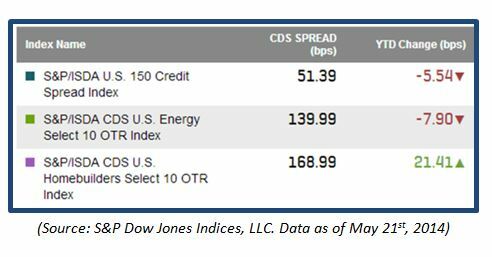 Energy CDS spreads while trading more closely in price to homebuilders have also fallen in 2014 (S&P/ISDA CDS U.S. Energy Select 10: -7 bps). 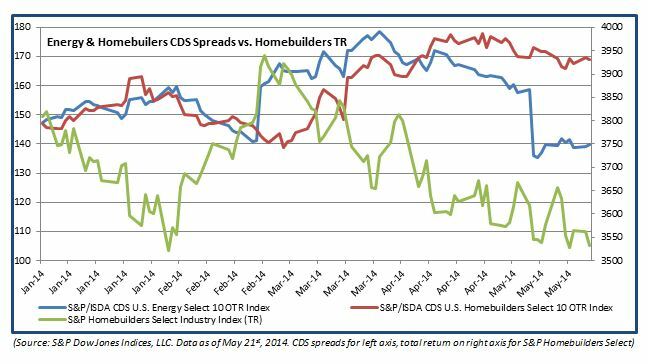 The homebuilders’ market sector that was once catalyst to driving the U.S. economy with the wide breathe of industries whom benefitted from its success, is underperforming and viewed as increasingly risky compared to its peers, even in lieu of positive growth. NOTE: One should be mindful to differentiate the homebuilders market from the overall housing market (which can be tracked using S&P/Case-Shiller National Home Price Index).